We have worked hard to build up an enviable reputation and are well known for reliability, friendly approach, top quality services and professionalism. We have the experience and expertise to meet all your needs and requirements. We offer a friendly and professional service with an experienced team. Here at DFYI Skip Hire we offer a range of skip sizes for our customers. We are located in Machynlleth but can provide our services to the wider area include Aberystwyth and Dolgellau. Each of the commercial and domestic skips provided are easy to load, saving you time and money. On top of this, we have a 24-hour answer service to offer you the information you need and competitive prices are always offered. 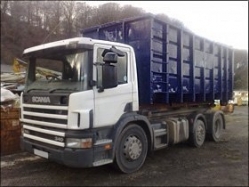 For more details about our skips, call us today on 01654 702 025. Our 4 and 6-yard skips are ideal for domestic users as they offer enough space for you to remove unwanted waste. For commercial customers, our larger skips are better suited. All items hired from us will be delivered at a time that works for you. Furthermore, a 24-hour service is available for our clients. If you would like to find out more about our commercial or domestic skips, call our team today in Machynlleth on 01654 702 025. You can also fill in our contact form and we will get back in touch with you at a time convenient to you.